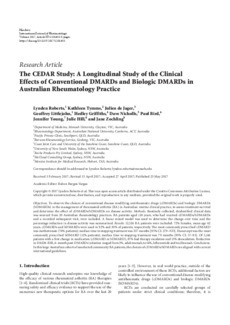 Objectives: To observe the choices of conventional disease modifying antirheumatic drugs (cDMARDs) and biologic DMARDs (bDMARDs) in the management of rheumatoid arthritis (RA) in Australian routine clinical practice, to assess treatment survival and determine the effect of cDMARDs/bDMARDs on disease activity. Methods: Routinely collected, deidentified clinical data was sourced from 20 Australian rheumatology practices. RA patients aged ≥ 18 years, who had received cDMARDs/bDMARDs and a recorded subsequent visit, were included. A linear mixed model was used to determine the change over time and the percentage reduction in disease activity was summarized. Results: 12,526 RA patients were included: 72% females, mean age 62 years. cDMARDs and bDMARDs were used in 92% and 30% of patients, respectively. The most commonly prescribed cDMARD was methotrexate (76% patients); median time to stopping treatment was 337 months [95% CI: 279-ND]. Etanercept was the most commonly prescribed bDMARD (12% patients); median time to stopping treatment was 79 months [95% CI: 57-93]. Of 5,341 patients with a first change in medication (cDMARD or bDMARD), 87% had therapy escalation and 13% deescalation. Reduction in DAS28-ESR, 6-month post-DMARDs initiation ranged from 3%, adalimumab, to 14%, leflunomide and tocilizumab. Conclusions: In this large Australian cohort of unselected community RA patients, the choices of cDMARDs/bDMARDs are aligned with current international guidelines.